The 1849 account is contained within the pages of a diary written by a fifteen-year-old boy named David Henry Mordecai. He was the son of Moses Cohen Mordecai, a prominent South Carolina businessman and politician whose shipping company held a contract to supply Key West with delivery of the United States Mail. 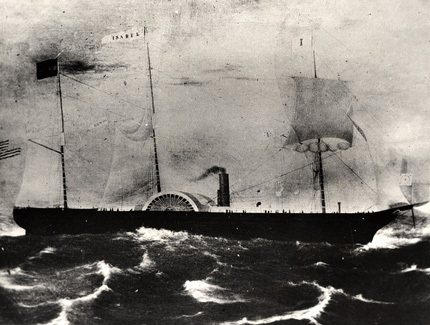 Prior to the Civil War, Mordecai’s “Isabel,” a three-masted paddle steamer, represented a vital connection between Key West and the outside world, providing twice-monthly mail, cargo, and passenger service to Charleston and Havana. 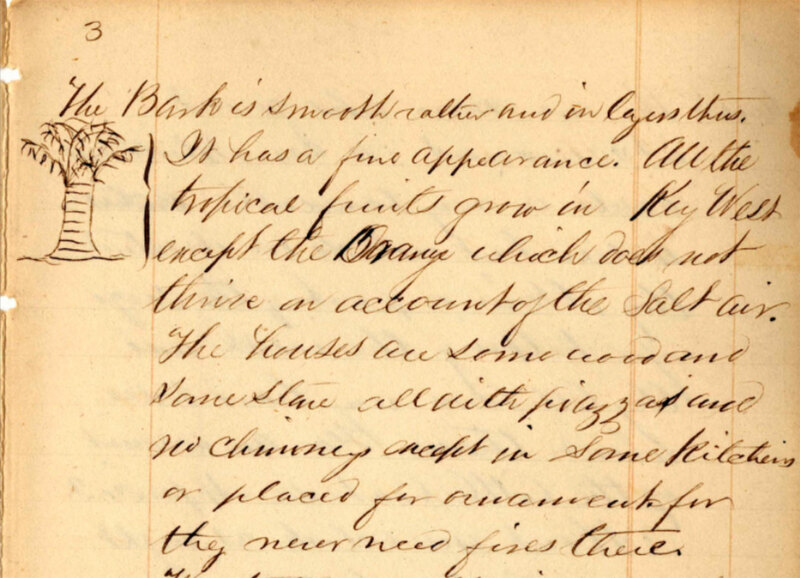 Donated to the College of Charleston as part of the Thomas J. Tobias Papers in 1994 and added to their Lowcountry Digital Library in 2010, young David’s handwritten document transmits an impressive breadth of sense-impressions and acute observation. And though the section devoted to the Keys is just four pages long, its detail makes it one of the important documents of Key West’s early history. About noon we passed a part of the gulf stream, this is a great natural curiosity for it is a current running north I believe about 60 miles broad and its waters are of a different color than the ocean and they do not mingle with it. I am ignorant of the cause. In the stream we saw turtles, sharks, flying fish & some dolphins. During all this day we sailed along the Florida Coast and passed two keys belonging to Father one called Indian Key and the other Salt Key. Indian Key has some houses of fishermen upon it. We also passed Cape Florida and the place where stood the light house in which the keeper was smoked by the Indians in the Seminole War. About 7:00 we arrived at Key West an island and a safe place for vessels in distress. It contains about 3,000 inhabitants. We walked about the place and here I first saw a cocoanut tree. It is beautiful from 50 – 60 – 70 feet high and no leaves except at the top… All the tropical fruits grow in Key West except the Orange which does not thrive on account of the Salt air. The houses are some wood and some stone all with piazzas and no chimneys except in some kitchens or placed for ornament for they never need fires there. We strolled along the different places and found in almost every place men as drunk as they could be. The population is composed of but few really respectable persons, a great many wreckers, sailors and negroes who when they get a chance generally take more than their fill in intoxicating drinks. Mordecai left for Cuba the next day and filled the remaining 150 pages of his diary with vivid and arresting descriptions whose sound composition belies his young age. The precocious youth would soon go off to Harvard, where he presumably met some “really respectable persons,” and travel widely throughout Europe and North Africa. He died, tragically, at 25. Mordecai & Co.’s three-masted paddle steamer, the “Isabel,” provided mail service to Key West during the years before the Civil War. From the Monroe County Public Library in Key West. One of my relatives. My mothers maiden name is Mordecai. The steamship was most likely named after Elizabeth Whitlock, or Isabel, who was married to the families founder here in the new world who was one Moses Mordecai from Bonn, Germany. They settled in Philadelphia. After Moses died she married a Cohen. I think that is where David’s middle name came from. Much of the family migrated out of Pennsylvania into South Carolina.